Are you alone in the city with no family or relatives to baby sit? Do you need occasional babysitting to get your haircut, visit the dentist, or enjoy an evening out with your partner? Perhaps a babysitting co-op is the answer. To find a babysitting co-op in your area, check the community centers, mom’s time out groups or churches to see if one already exists. If not, check with other moms at the playground while you are supervising your children. Many co-ops exist by word of mouth only. Numbers: Aim for about 10 – 12 families. Not too big that you don’t know everyone, and not too small so that you run out of phone numbers before you find a commitment to baby sit your kids whenever you need it. Tokens: wood disks, poker chips, painted coins, etc. Many co-ops start with 30 hours allocated to everyone to begin, and everyone leaving has to hand in 30 hours. Tokens are made in different colors to represent one hour and 1/2 hour tokens. In my co-op, we pay one token per hour for the first child and a quarter token for each child per each additional hour. That way, larger families are not penalized too much. Some co-ops charge a half token for second and subsequent children. Rules: Keep the rules to a minimum, and make sure that all charter members agree to them. Some general considerations are that the mother is the one babysitting unless otherwise agreed to. During the day, the children to be babysat are transported to the babysitters and in the evening the babysitter comes to the children’s house to sit and put the kids to bed in their own house. Meals, transportation and outings are negotiated between two parties. Discipline policy should definitely be discussed at the charter member meeting. Communication is important, so misunderstandings are avoided. Structure: Some co-ops have a Secretary that one would phone and request a sit. The Secretary would then phone the lowest token holder first to fill the sit and go down the list if needed. The Secretary position is rotated monthly. 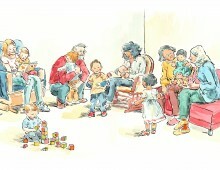 Other co-ops have each person do their own phoning for sits, which has the advantage that the person can choose who their child likes to play with the most. Generally, the person with the lowest number of tokens should be phoned first. Regardless of structure, members should meet monthly on a rotational basis, at each other’s house, to discuss token counts, arrange future sits, and problem solve any issues that have come up. Moms really look forward to the monthly meeting as it’s a social visit and support group also! The advantages of babysitting co-ops are many. To children, they are like a play date with their friends. Often, babysitting other children helps keep yours occupied and the babysitter can get more done too! It’s inexpensive, and parents have the security of knowing that an adult is in charge rather than a teen. Many Moms like to baby sit at another’s house in the evening as they are free to do some quiet work, read, or hobbies once the children are in bed, things they wouldn’t otherwise get done in their own home. Perhaps the most compelling advantage is that the social and support network of similar aged children and parents is wonderful to have in this day of isolated nuclear families. Previous postWorried about Summer Learning Loss? Isn’t Minecraft Educational?